Product Description: This book is a must for enthusiasts of outstanding high-performance automobiles. 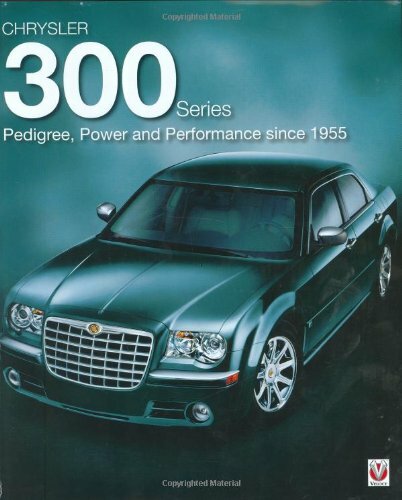 It examines in detail all the great Chrysler 300 models from 1955 to the latest versions including the 425 horsepower 2005 300C SRT-8 model and the 300's running-mate, the 2005 Dodge Magnum. With hundreds of color and black and white photos, a carefully researched text, production and sales data, and a year-by-year study of each Chrysler 300, this is a high-quality book celebrating the origin and return to glory of one of America's most respected high-performance automobiles. Three eras of the Chrysler 300 are covered: the first spans of the years 1955-1965; the second 1998-2004, when Chrysler revived the 300 name as the front wheel drive 300M; the third age began in 2004 when four all-new rear wheel drive Chrysler 300 models were introduced for the 2005 model year.